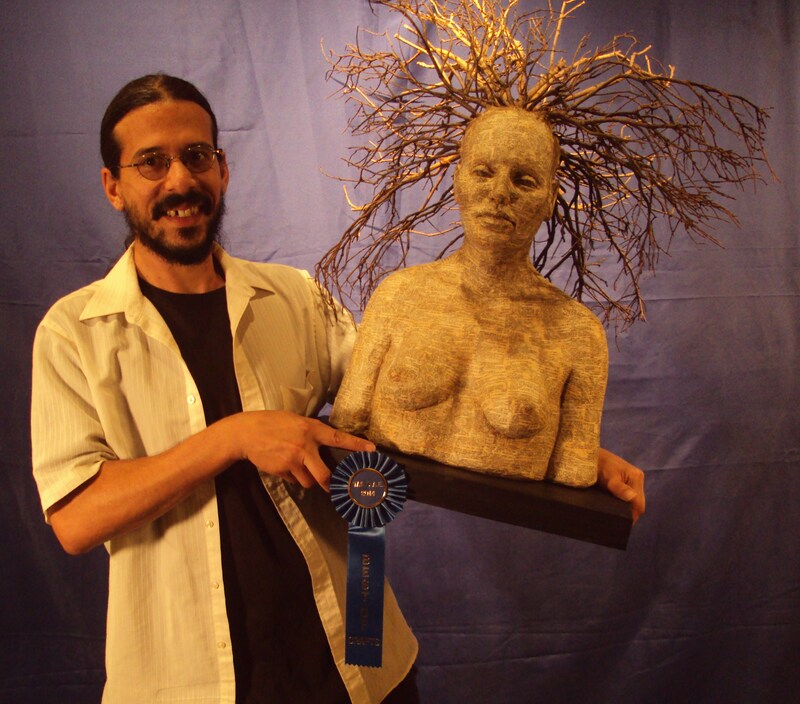 Henry Buerckholtz takes home the Best in Show at the WSOAE Spring 2016. Congratulations to all the winners of the spring 2016 show. Photos of winning artists are now up on our website photo gallery. Click to see our Winners Circle web page. 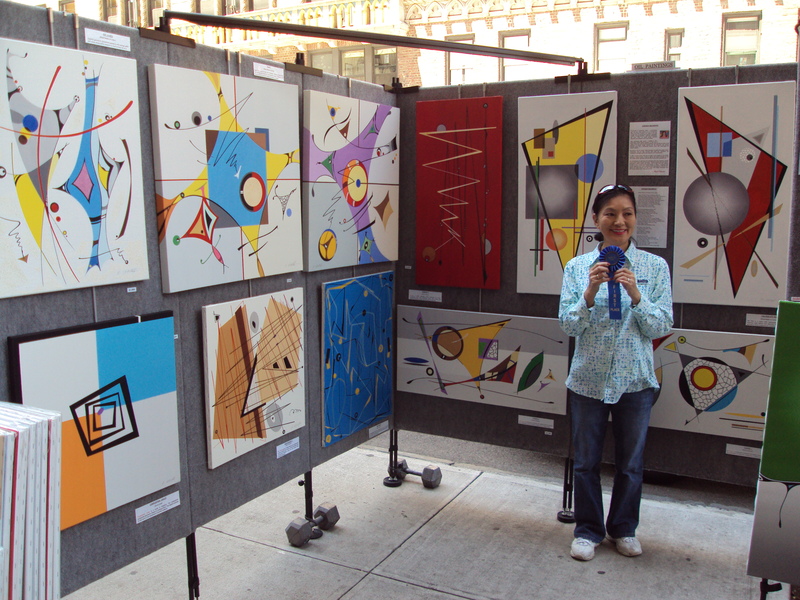 On the first weekend of its Fall 2014 show, The Washington Square Outdoor Art Exhibit honored 23 artists with awards in the categories of fine arts and fine crafts. The awards totaled several thousand dollars. The judges for fine arts and photography included non-exhibiting artists Roger Rossi and Carole Teller, Jon Harding, curator of the Century Association, and Alexander Katlan, distinguished conservator of oil paintings and art historian. 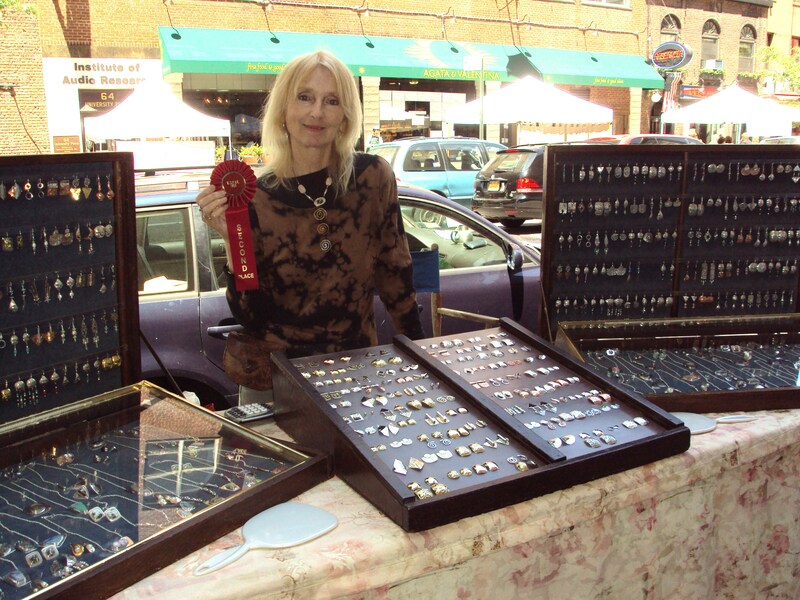 Sculpture and fine crafts were dealt with by our veteran judge, Monona Rossol, principal of ACTSNY (Arts, Crafts and Theater Safety, NY). Artists and crafts people brought their submissions for prize jurying to the Salmagundi Club at 47 Fifth Avenue on Saturday morning, August 30. They returned on the next day, Sunday, August 31st, to pick up their work and learn if they had won an award. 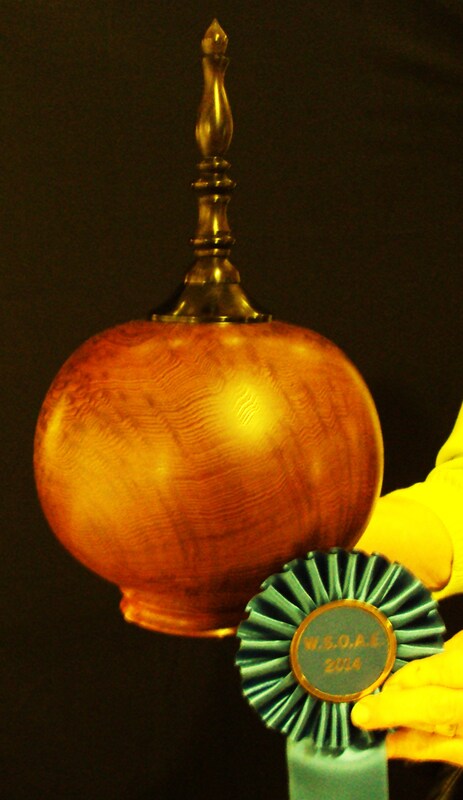 The roster of the prizewinners for the Fall Show follows. To see images of the prizewinning artwork and crafts, click here. 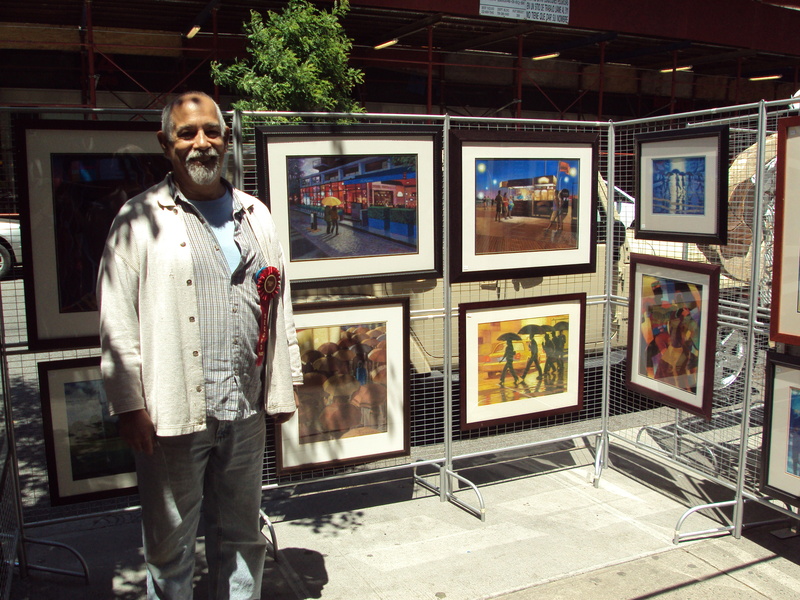 On the first weekend of its Spring 2014 show, The Washington Square Outdoor Art Exhibit honored 25 artists with awards in the categories of fine arts and fine crafts. The awards totaled several thousand dollars. 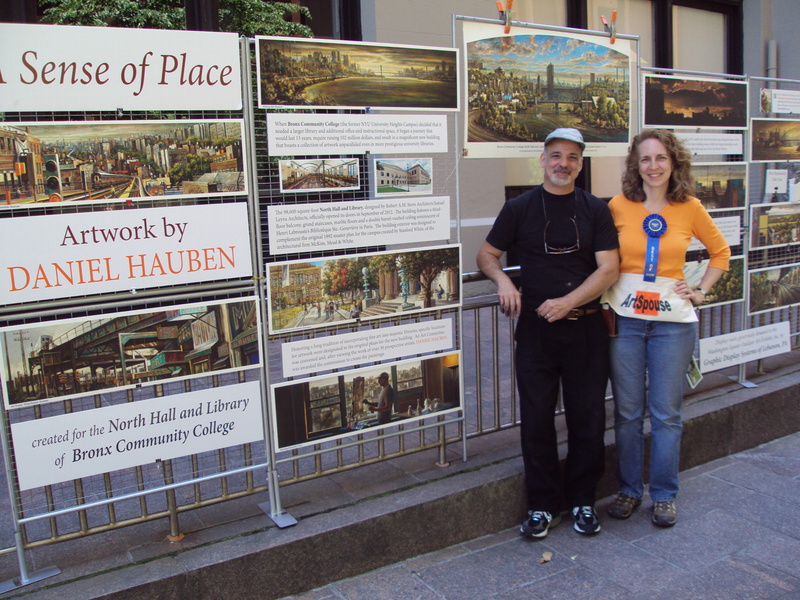 The judges for fine arts and photography included non-exhibiting artists Elizabeth Spencer and Robert G. Carter (a long-time faculty member at Nassau Community College), and Paul Stockschlaeder, a member of the WSOAE Board as well as that of the Salmagundi Club. 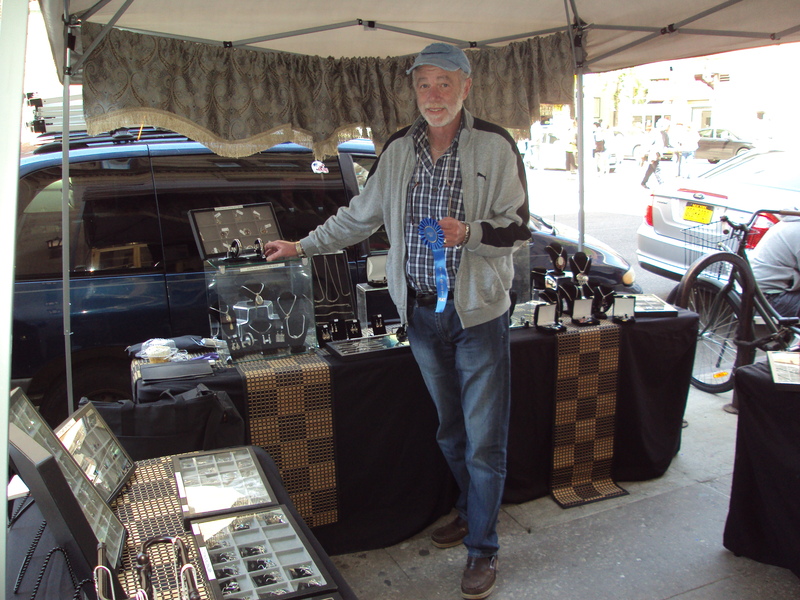 Sculpture and fine crafts were juried by our veteran judge, Monona Rossol, principal of ACTSNY (Arts, Crafts and Theater Safety, NY). Artists and crafts people brought their submissions for prize jurying to the Salmagundi Club at 47 Fifth Avenue on Saturday morning, May 24th. They returned on the next day, Sunday, May 25th, to pick up their work and learn if they had won an award. The roster of the prizewinners for the Spring Show follows. To see images of the prizewinning artwork and crafts, click here. 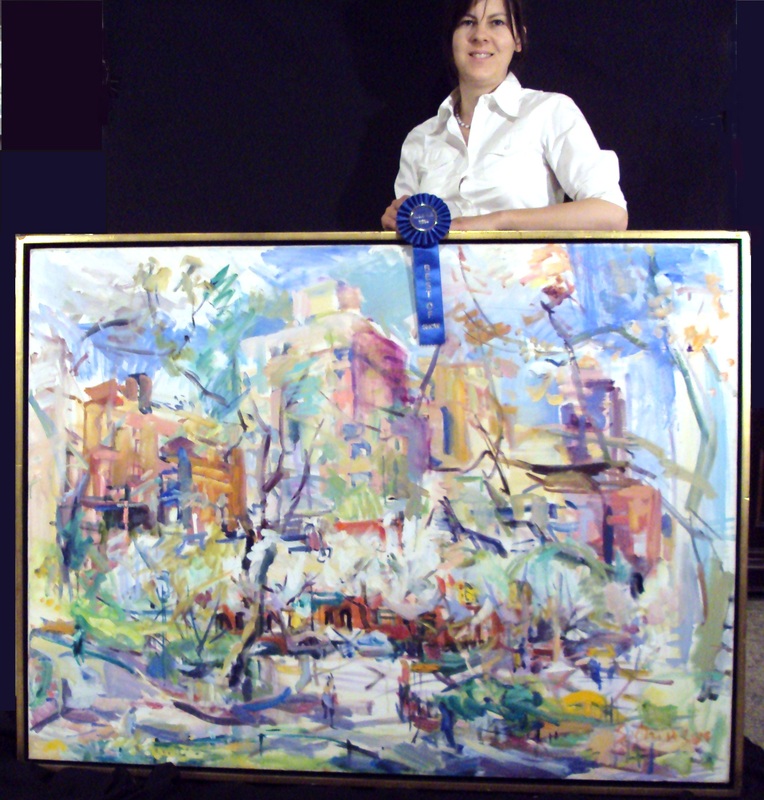 Sonia Grineva, New York City – “Spring in New York” – Oil – Given by Marlene Schiller as the Dorothy Schiller Bern and Albert E. Schiller Memorial Award. 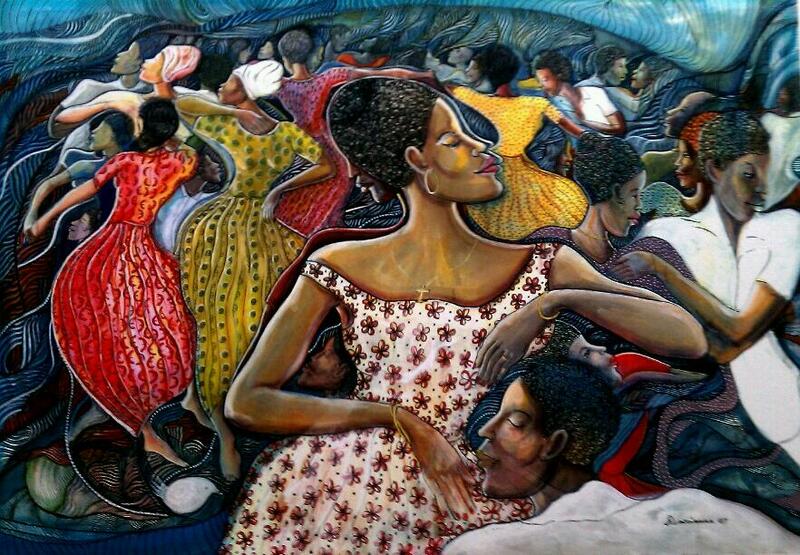 First Prize – Joel Beckwith, Jamaica, VT – “Mediterranean Cafe” — Given as the Rose Parsons Memorial Award by Mrs. Doris P. Radow. 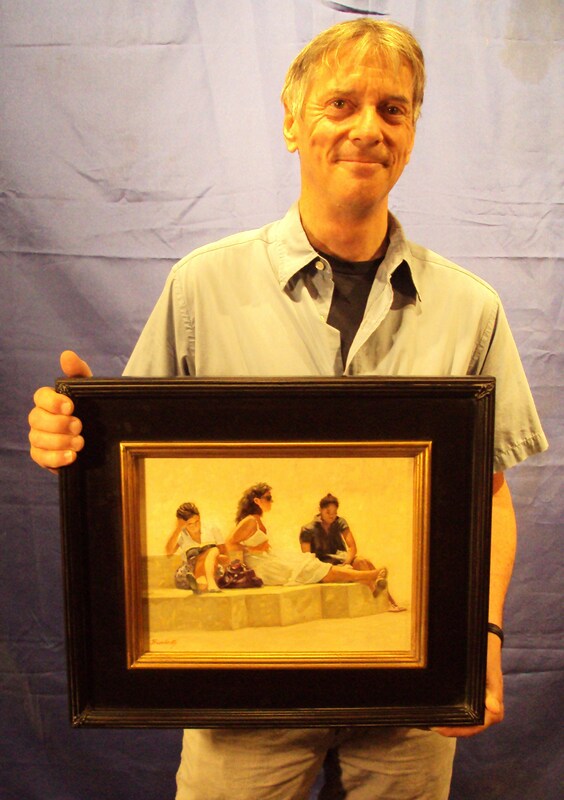 Second Prize – David Itchkawich, Portland, ME – “Illus. From the Fable of the Contented Birds” – Prize given as the Margaret Moulton Memorial Award by Mrs. Natalie Ballin. 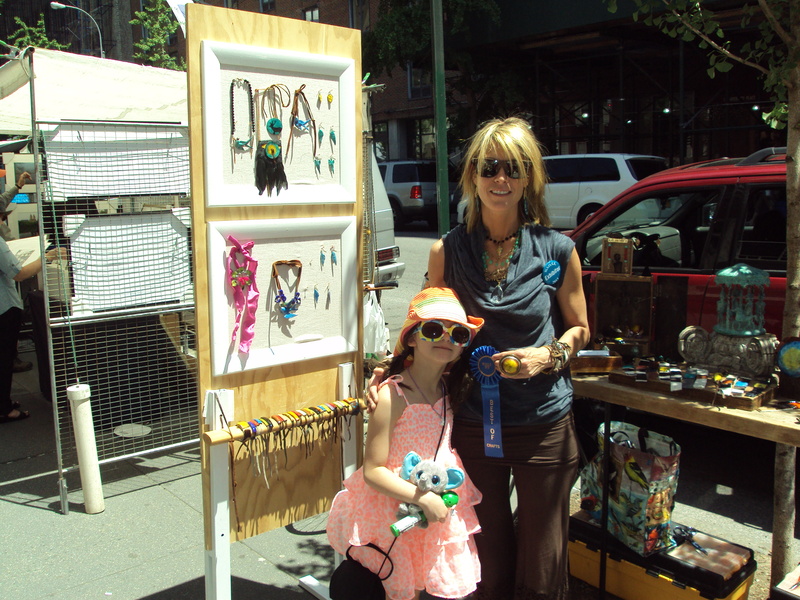 On the first weekend of its Fall 2013 show, The Washington Square Outdoor Art Exhibit honored 25 artists with awards in the categories of fine arts and fine crafts. The awards totaled over four thousand dollars. 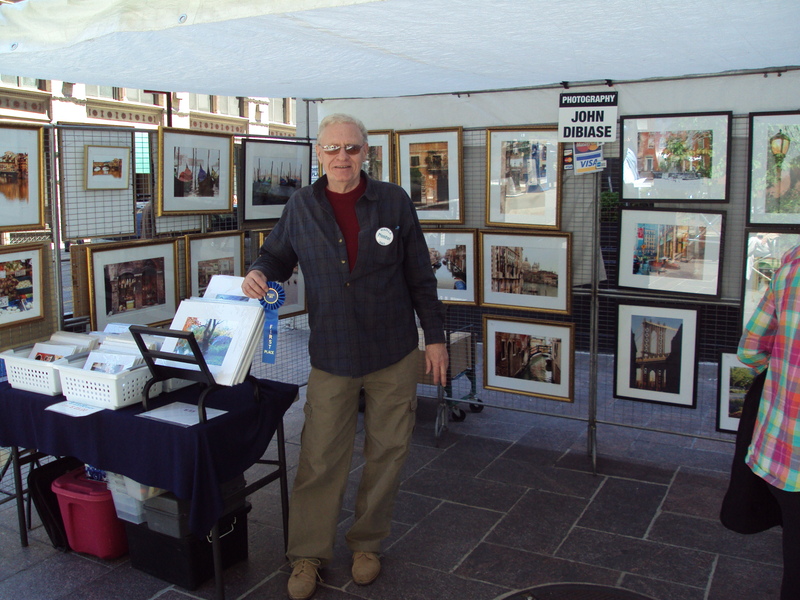 The judges for fine arts and photography included non-exhibiting artists Carol Teller and Robert G. Carter (a long-time faculty member at Nassau Community College) and Paul Stockschlaeder, a member of the WSOAE Board as well as that of the Salmagundi Club. 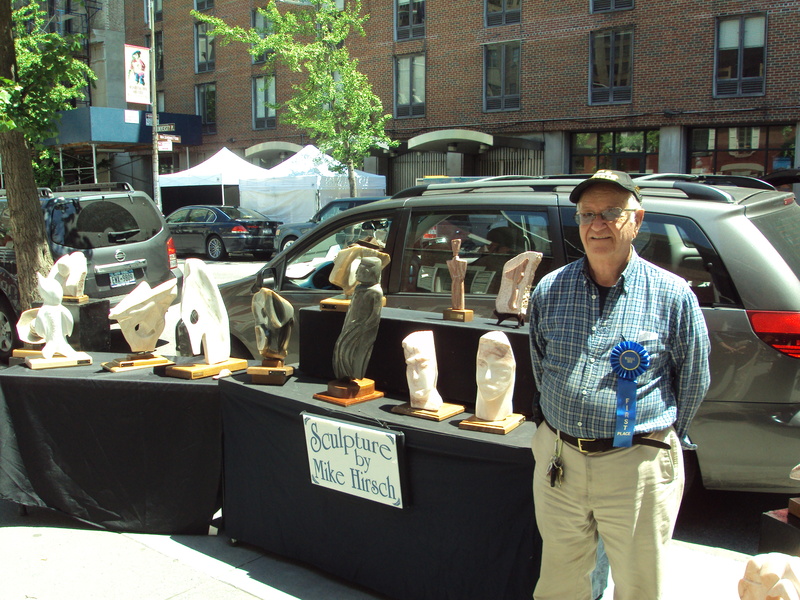 Sculpture and fine crafts were juried by our veteran judge, Monona Rossol, principal of ACTSNY (Arts, Crafts and Theater Safety, NY). Artists and crafts people brought their submissions for prize jurying to the Salmagundi Club at 47 Fifth Avenue on Saturday morning, August 31st. They returned on the next day, Sunday, September 1st, to pick up their work and learn if they had won an award. 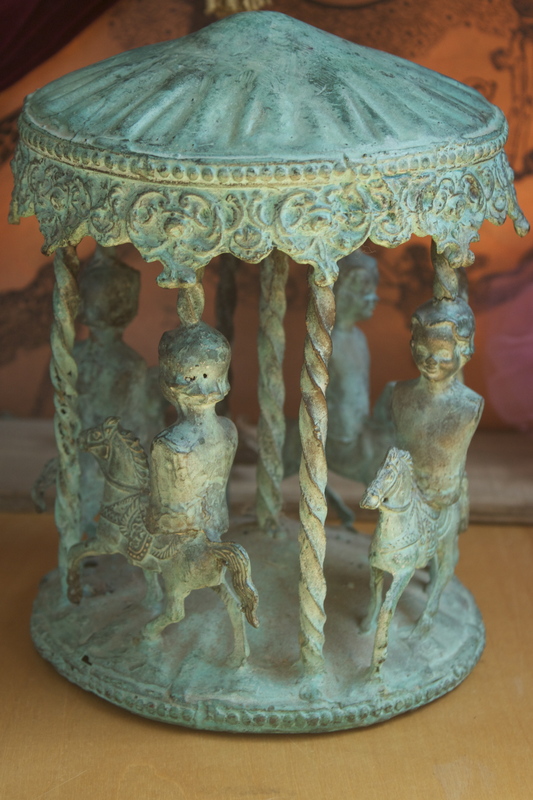 Our shows always start on a Saturday, and it’s our custom to jury for prizes on that day, using the facilities of the Salmagundi Club at 47 Fifth Avenue. But this spring, for the first time in many years, the opening day had terrible weather–temperatures were low (in the forties), winds were high and showers and squalls were frequent. The upshot was that very few exhibitors set up their booths and only a very few pieces were brought over to Salmagundi for jurying. Daniel Hauben, Bronx, New York for 22 images of the Bronx created for the new library at the Bronx Community College and rendered as half-size giclee reproductions of the original large oils – prize given by Ms. Elizabeth Forrest. 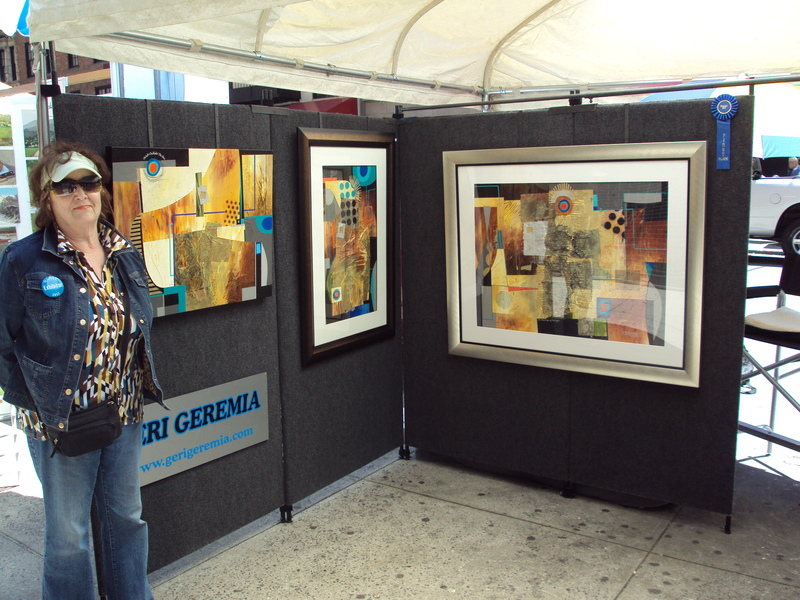 First Prize — Geri Geremia of East Meadow, New York, for mixed media abstract paintings, incorporating gold leaf – prize given by New York University, Government & Community Affairs Office, Mr. Joseph Manoleas. 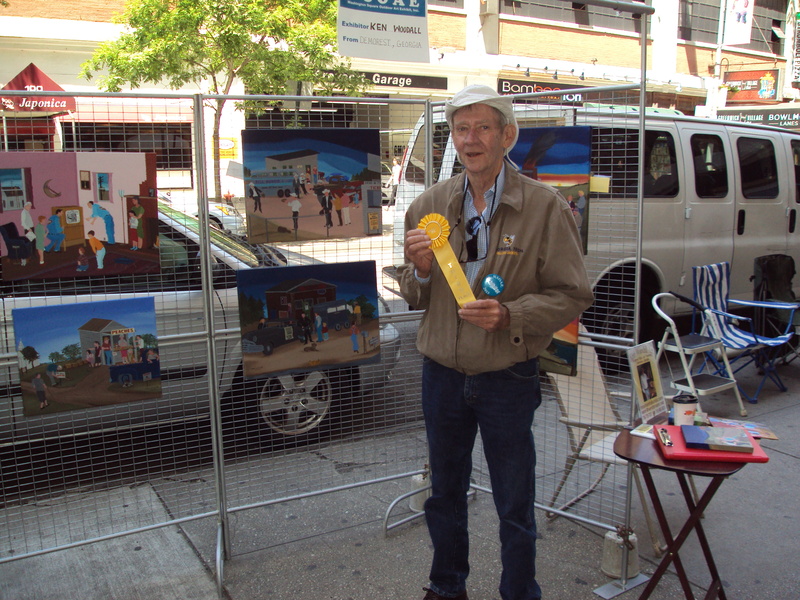 Second Prize — Brent Bailer of Jamaica New York for paintings in assorted media, many involving umbrellas – prize given by Mrs. Doris Radow as the Seymour Radow Memorial Prize. 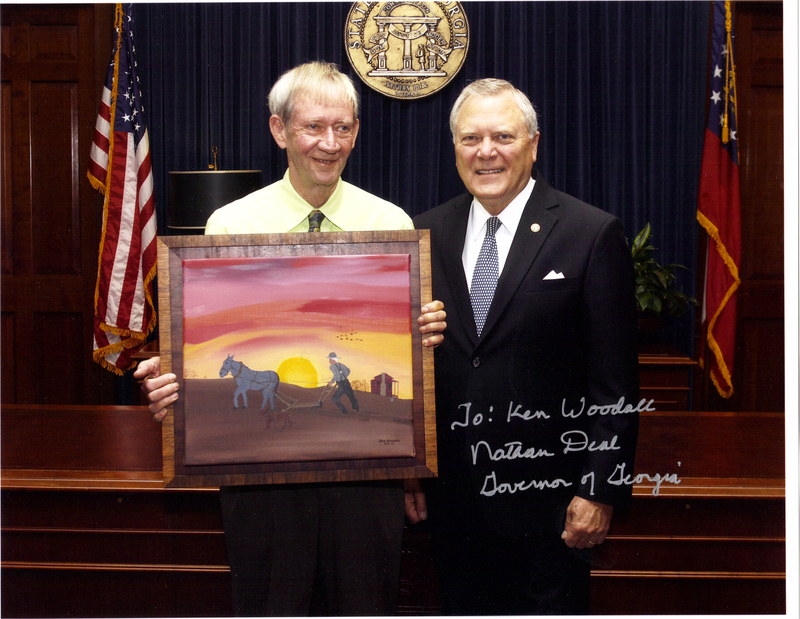 Third Prize — Ken Woodall of Demorest, Georgia for acrylic folk art paintings – prize given by The Art Students League of New York, Mr. Ira Goldberg, Director. First Prize — Atsuko Okamoto of Boynton Beach, Florida – Prize given by Dr. & Mrs. Carl Lebowitz as the Mollie Lebowitz Memorial Award. 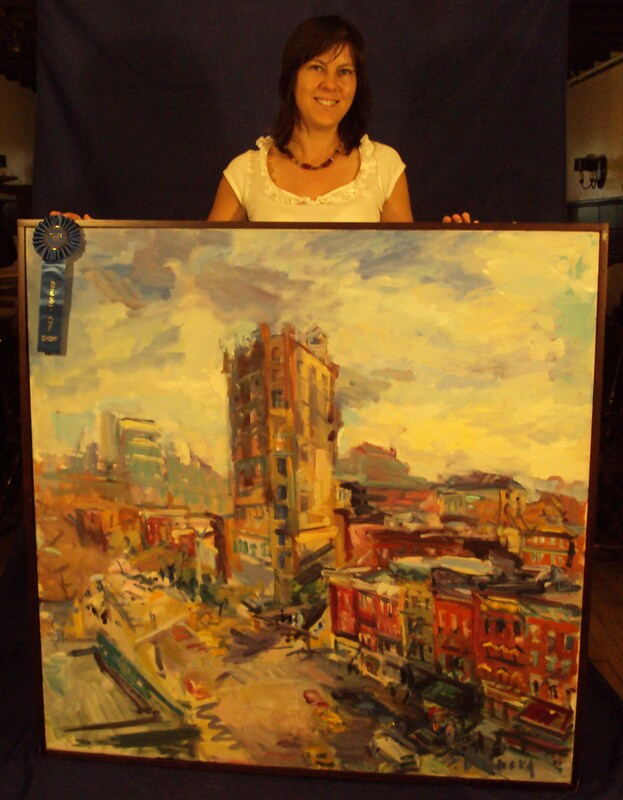 First Prize — John DiBiase of New York City – prize given by New York Central Art Supplies and Mr. & Mrs. Douglas Ruby. 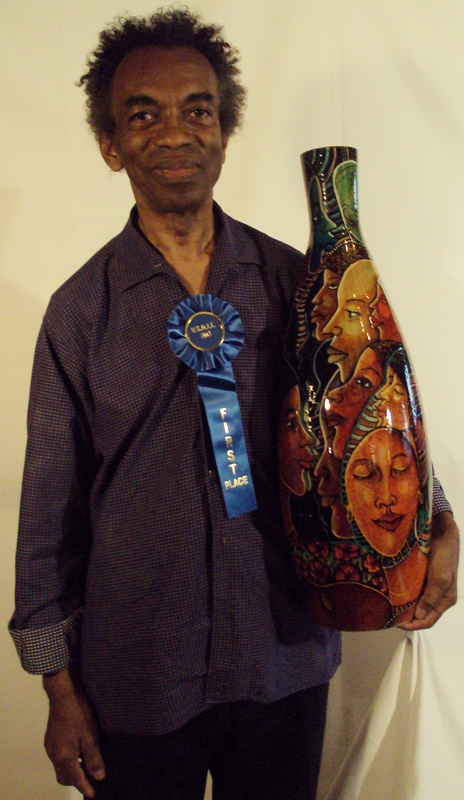 First Prize — Mike Hirsch of Plainview, New York – prize given by an anonymous donor in memory and honor of Mr. Edward Martin, a long time participant in WSOAE shows and winner of numerous prizes in them. 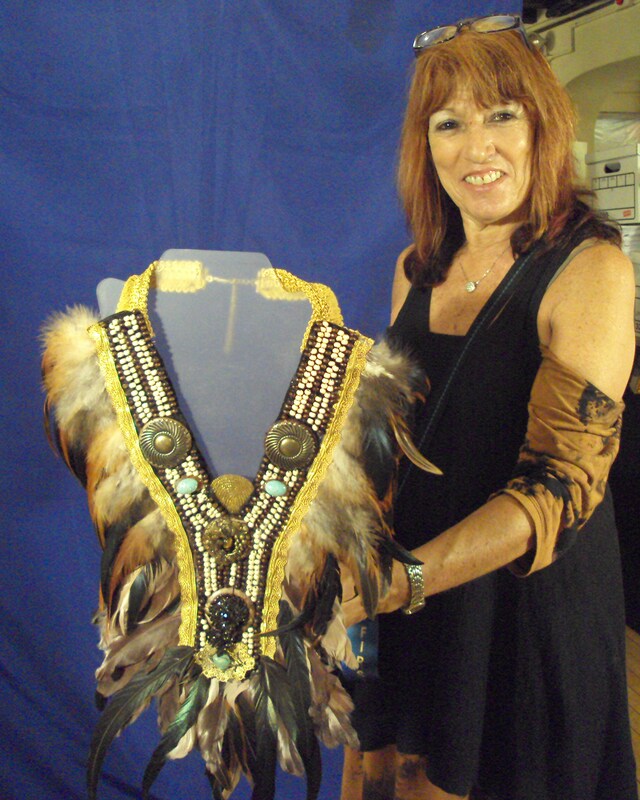 Best of Show — Michelle DaRin of Jamesville, New York – prize given by Mrs. Natalie Ballin as the Samuel & Lawrence Ballin Award. First Prize — Wayne D. DuBois of Ocala, Florida – prize given by Mr. & Mrs. Paul Stockschlaeder as the Stockschlaeder and Radliff Memorial Award. 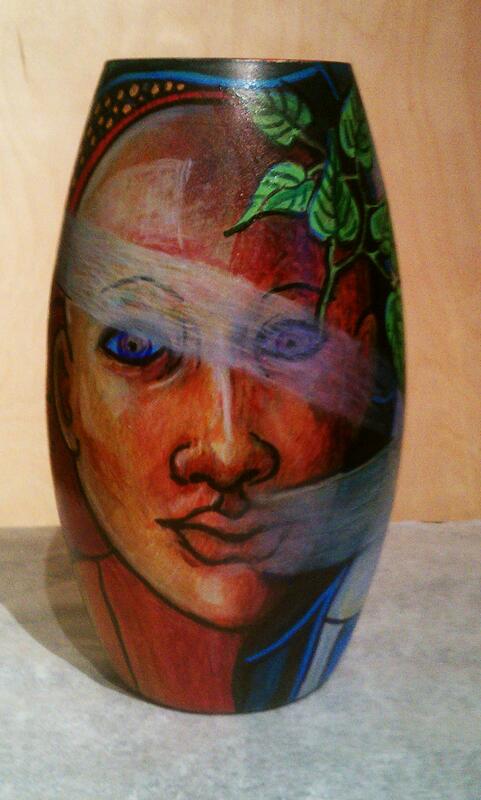 Second Prize — Jane Edsall of Mt. Sinai, New York – prize given by Ms. Marlene Schiller as the Albert Schiller Memorial Award. On WNBC NY Nightly News, on Wednesday, May 29th, Kevin McEvoy talked about the Washington Square Outdoor Art Exhibit and how it helped him launch his career.